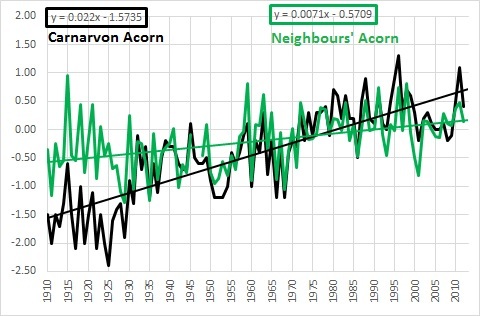 In a previous post I looked at the warming outliers in the Acorn network– those sites that had homogenisation adjustments that created a difference of more than +2 degrees Celsius between the Acorn trend and the raw trend in minima. 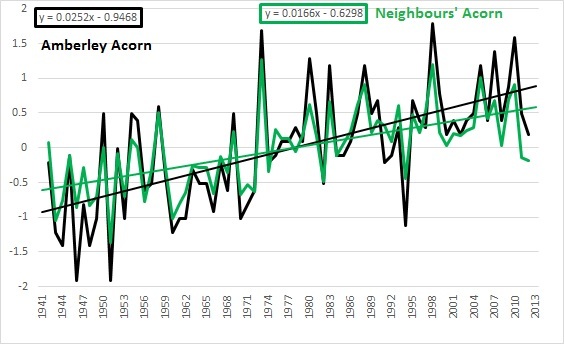 In all of these six examples, the adjustments had created trends that were not just greater than the raw trends at each site, not just the mean of their Acorn neighbours raw data trends, but greater than the Acorn trends of their neighbours, and in all but one, greater than each of the individual Acorn trends of their neighbours. In this post I consider the opposite scenario. 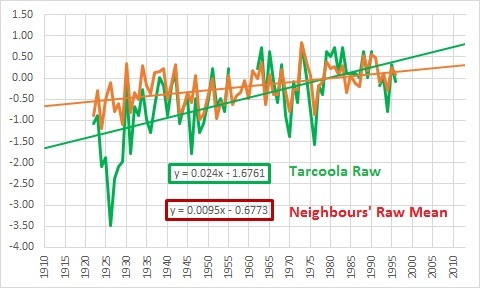 I look at one cooling outlier, Tarcoola in South Australia, where the cooling adjustments have created a difference in trend of -2.81C per 100 years. There is one other, Forrest in W.A., with an enormous cooling adjustment of around -2.14C, but I have little faith in the accuracy of the data there. Greg Geegman suggested in a comment that if a site that is adjusted downwards is cooled relative to the neighbour group, this may indicate the Percentile Matching algorithm operates iteratively, although Technical Report No. 49 does not mention this. An alternative explanation might be that the algorithm is too sensitive and exaggerates necessary adjustments. 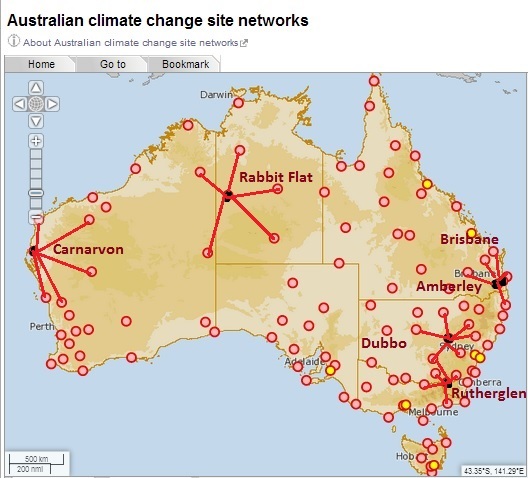 All data may be downloaded from the BOM website: Site networks and Climate Data Online. 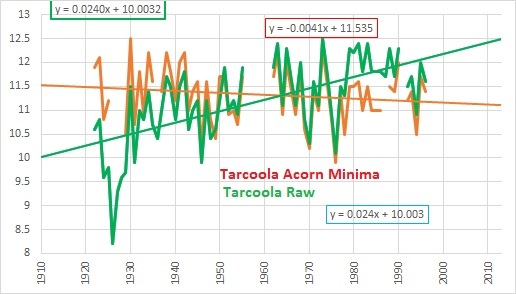 As before, I compare Tarcoola with its neighbours in the Acorn network, using anomalies from the 1961-1990 mean. Cooler trend than raw. Note the spurious data pre-1930. Tarcoola appears to need cooling. 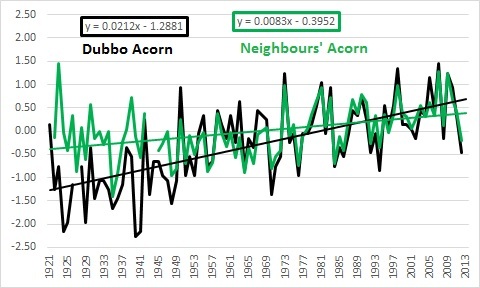 Tarcoola Acorn trend is also cooler than each of the neighbours’ individual Acorn trends. So which neighbours were used to make the Tarcoola adjustments? 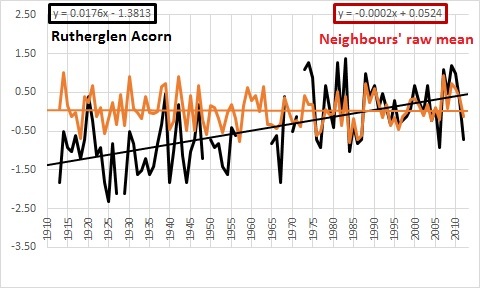 Both warming and cooling outliers show Acorn adjustments outperforming those of the neighbours. This suggests that the algorithm exaggerates adjustments, both warming and cooling, and needs serious re-examination. A lot of interest was generated by my last post on the Acorn outliers, especially the dependence on very distant sites for homogenisation adjustments. 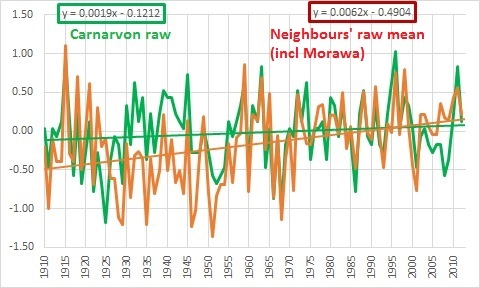 In this post I will compare Carnarvon’s closer neighbours – excluding Wittenoom, Meekatharra, and Morowa- to show how a better understanding of Carnarvon’s minimum temperature record may be derived, and how reliance on more distant sites with different climate regimes can distort adjustments. 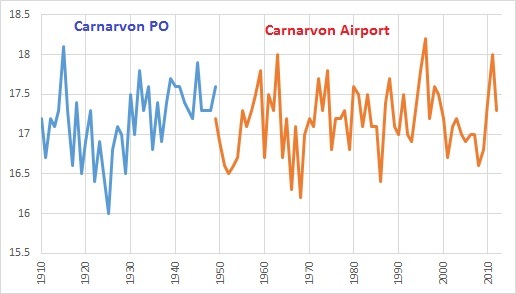 Carnarvon Airport 6011 has been recording temperatures since 1945. 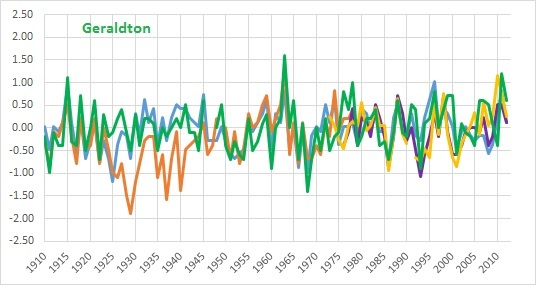 Before that, Carnarvon Post Office 6062 has data from 1885 to 1950 so there is useful overlap. 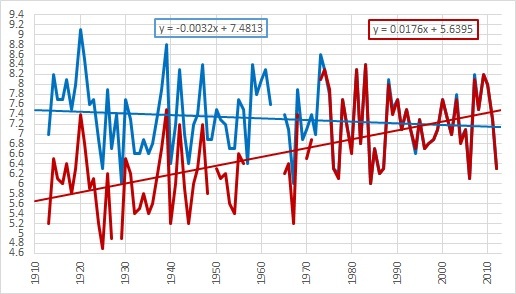 These records can be spliced by reducing the Post Office data for 1946-1948 by 0.4C (as the Post Office recorded increasingly warmer minima than the Airport in these years as shown by the monthly temperatures for 1949-1950) but making no changes to PO data before this, to produce a long composite record. 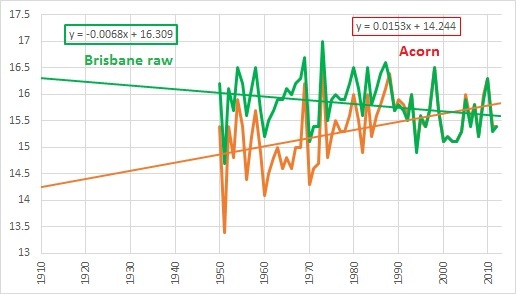 I commence at 1910 to compare with the official BOM figures. 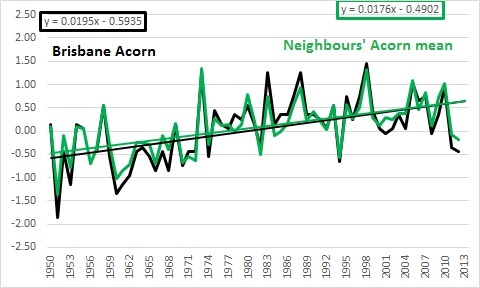 Note how Acorn reduces minima from 1974. Note the size of these adjustments. 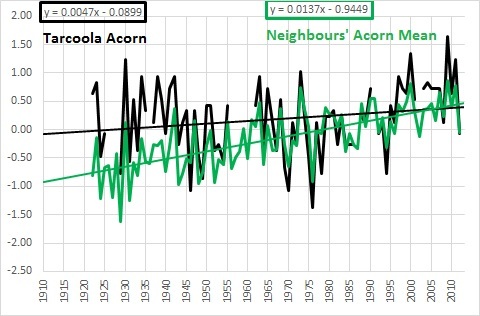 So at 1910 the Acorn record shows minima 1.8C less than the raw data. Now lets look at how Carnarvon’s neighbours compare. To do this we need to convert to anomalies from the 1961-1990 mean. 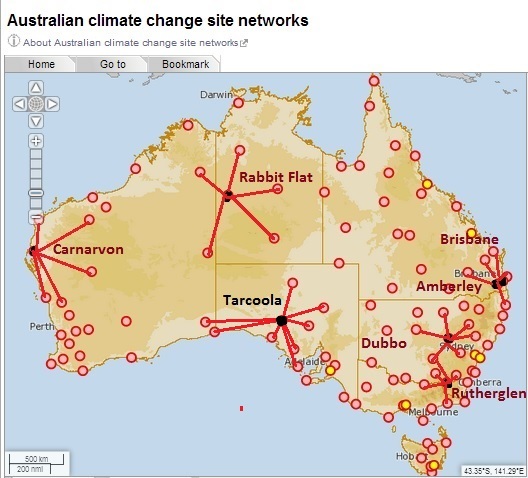 Neighbours are listed at Climate Data Online, ranging from 19 km to 296 km away, but most are too short or have too much missing data to be useful. The neighbours that I have used for comparison are: Hamelin Pool (174.4 km away), Winning (211.3 km), Emu Creek (248.5 km), and Learmonth (296.3 km). Learmonth is almost due north of Carnarvon, and like Carnarvon right on the coast, while the others are inland sites. We can see that there is close agreement for most of the time. There are minor periods of disagreement in the 1970s and 1990s, but the major disagreement is 1926-1950. Which is a more accurate reflection of Carnarvon minima- Carnarvon PO or Hamelin Pool? To find which is the odd one out, we need to look at other sites with data for this period. 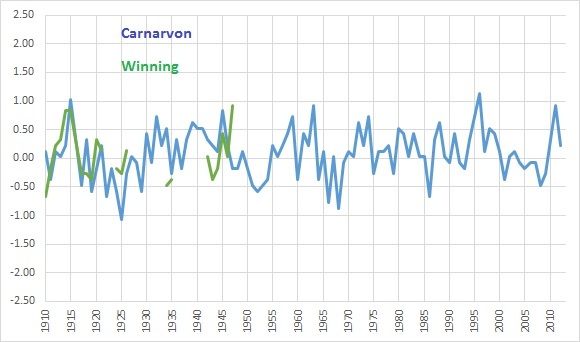 Winning, although confirming the approximate agreement 1910-1920, has very little data for 1926-1950, so we have to look further afield… all the way to Geraldton, which like Carnarvon is on the coast, but 447 km south. 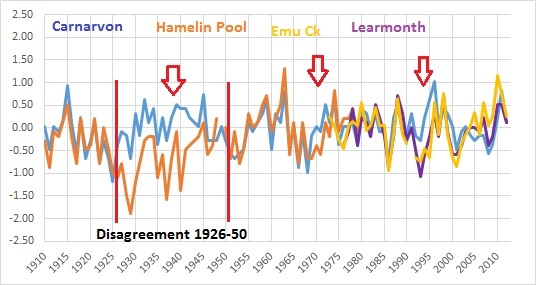 Hamelin Pool is clearly the outlier, so we can accept Carnarvon raw temperatures as reasonably accurate from 1910 to 1970. There is a short period in the 1970s of disagreement, but little difference after that… and Acorn does not adjust after 1974 anyway. How does this compare with Acorn? Can you pick the outlier? 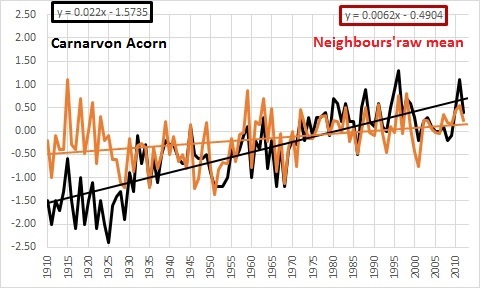 We can only presume that the Acorn homogenisation depends on data fed into the algorithm from much, much further away. 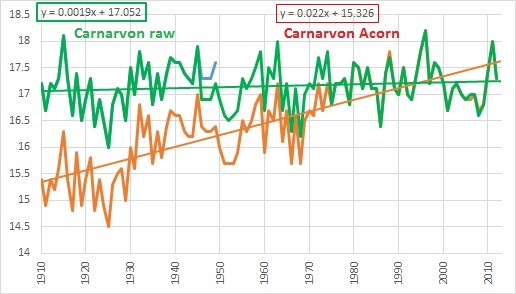 I can see no justification for any major adjustment to the raw record at Carnarvon. 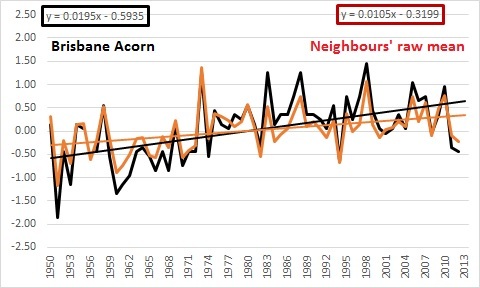 Rereading this, I just noticed a stupid error: I had said Brisbane’s Acorn trend is less than its neighbours’ Acorn trend, but it is actually more- as with the other outliers. 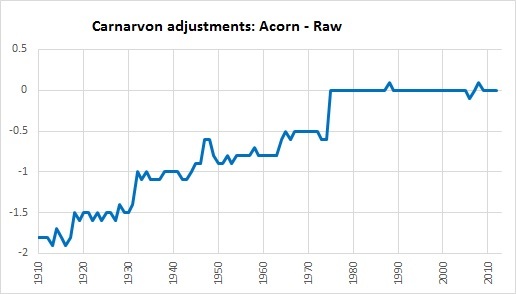 In my previous posts I showed how the Acorn adjustments to the ‘raw’ minimum temperature data have the effect of enormously increasing the apparent trend across the whole network, and very differently in different regions. 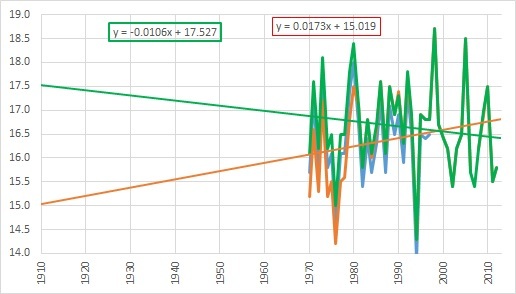 In this post I am looking more closely at the six locations where the adjustments cause a change in trend of greater than +2 degrees Celsius. These are: Brisbane Airport, Amberley RAAF, Dubbo, Rutherglen, Rabbit Flat, and Carnarvon. The purpose of homogenisation adjustments is to remove discontinuities in data, which show up as differences between the ‘candidate’ site’s record and those of its neighbours, the ‘reference’ sites. The Acorn method of detecting discontinuities uses pairwise comparison with up to 40 neighbouring sites, and this includes sites many hundreds of kilometres distant. Adjustments are made with a Percentile Matching algorithm which compares with up to 10 neighbouring sites. I use my own method to compare sites with neighbours. When comparing any sites, anomalies from a common base period (1961-1990) are used. Only sites with data (at least 15 years) in this period can be used. Sites also need long data records. While in closely settled areas there will be a selection of observation sites, very few meet these requirements. 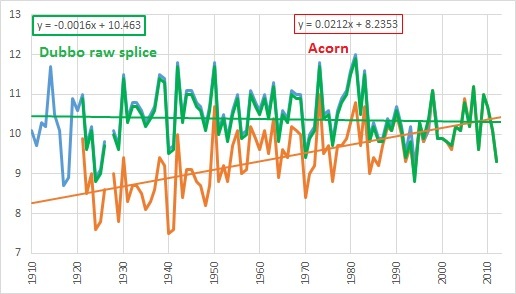 Therefore I compare the data of each of these six locations with those of their nearest surrounding Acorn sites’ ‘raw’ data, (adjusted by me only when necessary to create a long combined series), individually and with their mean. Even with only five neighbours, for Carnarvon and Rabbit Flat these can be over 500km away. 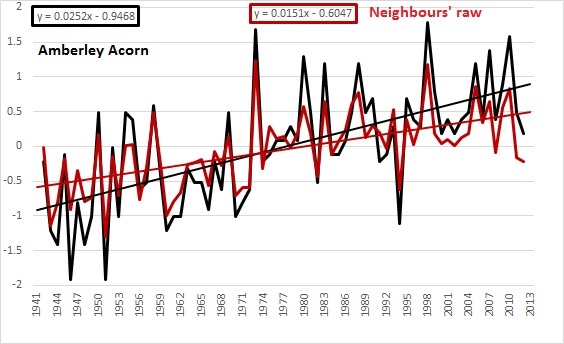 I then repeat this using Acorn (adjusted) data for the neighbours. Note the remoteness of Rabbit Flat and Carnarvon. The neighbours are: Amberley, Cape Moreton Lighthouse, Bundaberg, Gayndah, Miles, and Yamba Pilot Station. 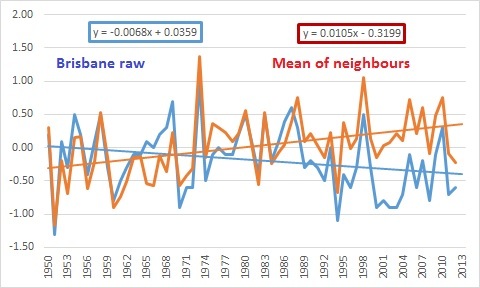 Note the adjusted trend (+1.95C per 100 years) is greater than the mean of the neighbours (+1.06) by nearly +0.9C. 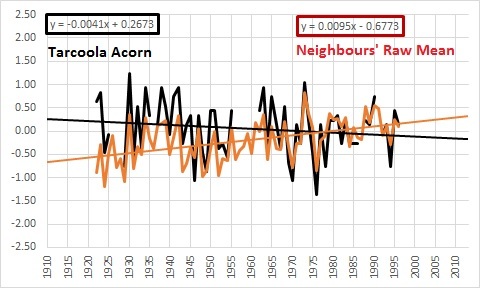 As you would expect, the data are now very similar, and the trend for Brisbane is thus 0.23C per 100 years more than the trend for the mean of the neighbours’ Acorn data. Neighbours are the same as Brisbane’s, including Brisbane, 50km away. Fig. 2b: Amberley and mean of neighbours (raw). 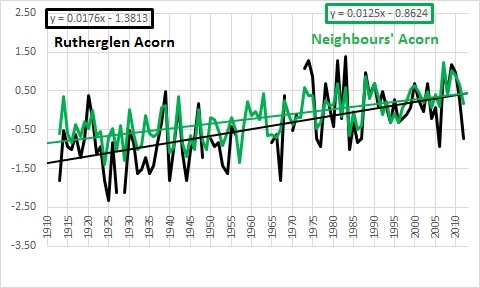 Note the trend is more than one degree steeper than the trend of the neighbouring Acorn sites’ raw data. 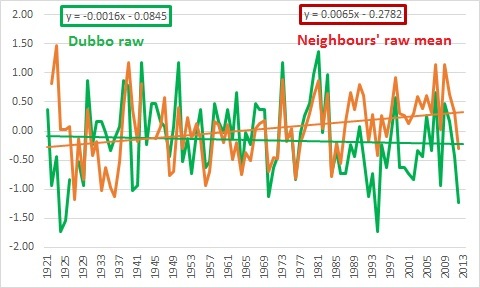 Amberley’s adjusted trend is +0.87C greater than that of the mean of its neighbours’ adjusted data. Fig. 3b: Dubbo and mean of neighbours. 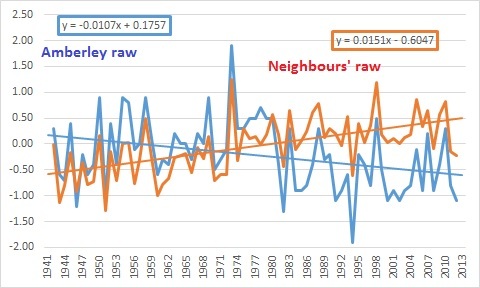 Now only +1.29C per 100 years greater than the neighbours. Fig. 4b: Rutherglen raw and mean of neighbours (raw). 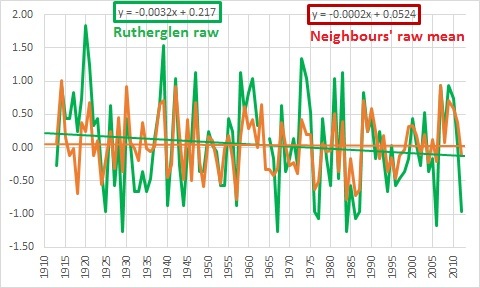 Note that Rutherglen’s cooling trend is only 0.3C different from that of its neighbours. 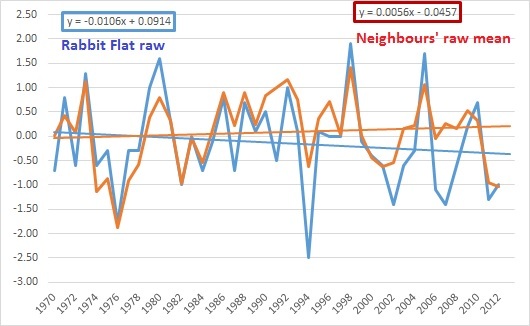 +0.51C per 100 years greater than the neighbours. Rabbit Flat is a roadhouse in the Tanami Desert on the track between Alice Springs and Halls Creek. Climate Data Online shows the current Rabbit Flat site 015666 as being 71km away from the old closed site 015548, though the Acorn Station Catalogue says it’s only 200 metres. This in itself is peculiar. The nearest non-Acorn site is Balgo Hills 211 km away. Acorn neighbours are: Giles (567km), Halls Creek (328km), Victoria River Downs (433km), Tennant Creek (440km), and Alice Springs (568km). Fig. 5b: Rabbit Flat and mean of neighbours (raw). 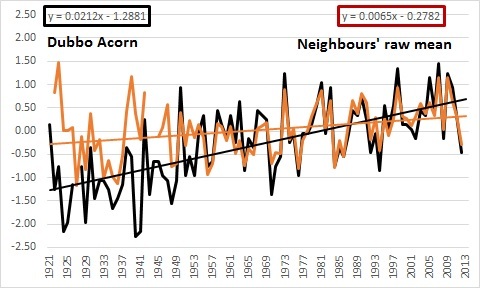 +1.17C more warming than neighbours. Rabbit Flat adjustments give it a trend +0.75C more than the neighbours’. Carnarvon’s Acorn neighbours are Learmonth (298km), Wittenoom (560km) , Meekatharra (524km), Geraldton (447km), and Morawa (538km). The only non-Acorn site with continuous data for the early part of last century is Hamelin Pool 6025 (174km away). Fig. 6b: Carnarvon and mean of neighbours (raw). 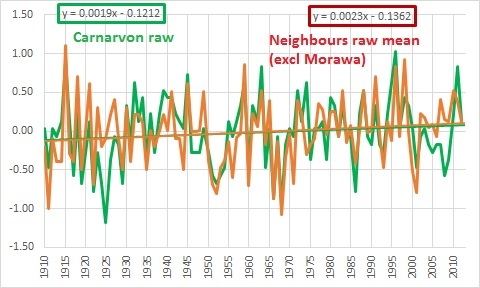 Now note the effect of just one of the neighbours- Morawa. Note the much closer comparison. 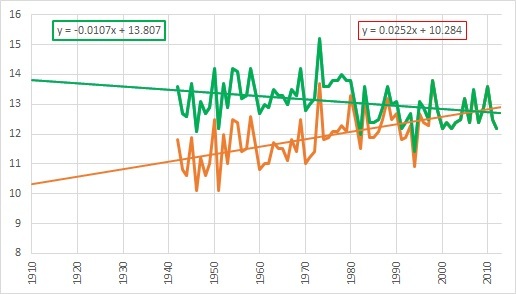 Note the trend is +1.58C per 100 years more. 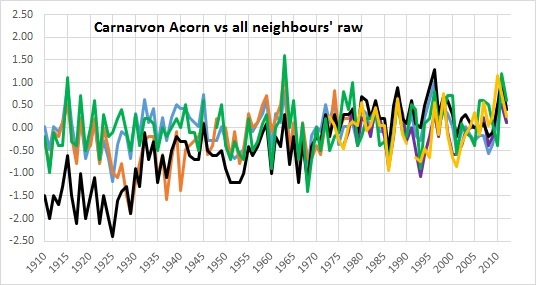 The Acorn trend at Carnarvon is also greater than the Acorn trends at each of the neighbours separately. 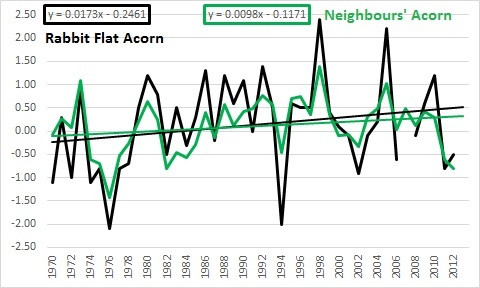 The Acorn adjustment algorithm creates homogenised data by comparing with up to 10 neighbouring sites. 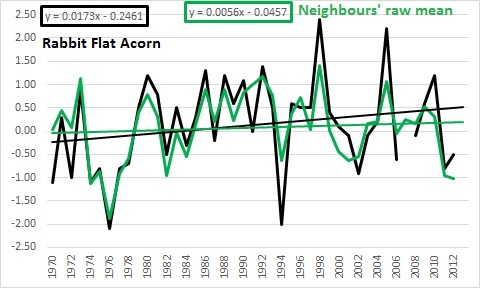 I have shown that the adjustments have made the Acorn trends greater than, not only the raw data trends for each site, not only the raw data trends of the closest neighbours in the Acorn dataset, but in every case but one, greater even than the trends of Acorn homogenised data from the same neighbouring locations. The adjustments created thus appear to be spurious and the algorithm faulty. You are currently browsing the kenskingdom blog archives for July, 2014.